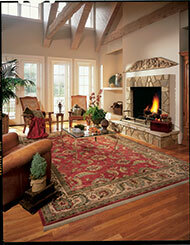 At Specialty Flooring our selection of custom made rugs is endless. You can purchase any remnant in stock and our staff will cut to your size and serge the edges for your custom area rug. 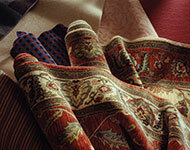 We carry a large selection of oriental and contemporary rugs at prices second to none. Check out our sale coupons for all the best in savings and current promotions. We can make area rugs in any size to fit your needs many with coordinating runners. 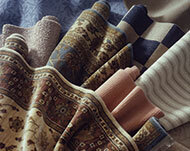 Let us help you design just the right rug to add the finishing touch to any room. Visualize the desired total look of the room. Do you want a room that's uncluttered and monotone or a room rich with colors or textures? 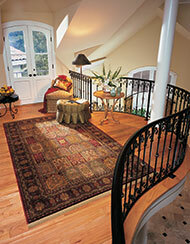 If you start with a totally empty room, choose a rug, then paint or paper the walls in colors found in the rug. Remember, the rug has to fit the room - in more ways than one. Consider how the room is used, how much traffic the area gets and who will view it under what light. 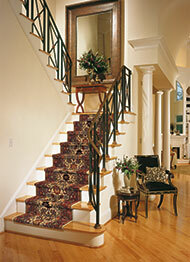 For high-traffic areas such as hallways and foyers, you may want a durable, patterned rug. Size up the size of the room and the area you want to cover. 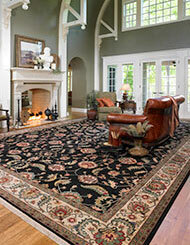 The most common area rug sizes are 4-by-6 and 6-by-9 feet. They work well under a coffee table. An 8-by-11-foot rug or larger can cover an entire room. Smaller area and scatter rugs can be ideal for adorning smaller spaces-a hearth, a bedside, and the area in front of a kitchen sink-with a splash of color and warmth. Don't be boxed in by the idea of getting a rectangular rug. A circular or octagonal-shaped floor covering can add flair.